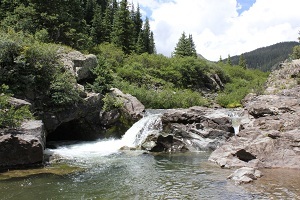 South Fork, Colorado is the place for all your outdoor activities as it is surrounded by nearly 2 million acres of National Forest at a starting elevation of 8,200 feet. 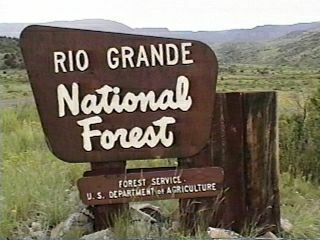 It is located at the junction of the famous Rio Grande River and its south fork on the west side of the San Luis Valley. It was originally founded as a lumber and mining town but has developed into a tourist destination. With hundreds of miles of National Forest land you can find some of the most spectacular driving tours in Colorado. 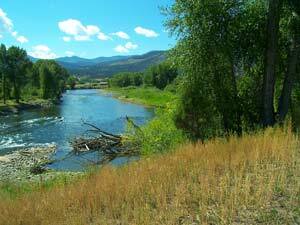 There is also horseback riding, mountain biking, hiking, rafting, fishing, and camping. South Fork is also a great starting point for many day adventures such as the Great Sand Dunes or Penitente Canyon. Rent a jeep or ATV for a day or the weekend to explore the four-wheel drive trails. It also has a great golf course, one of the three located in the San Luis Valley. A treat for your taste buds is the soft serve ice cream at the Malt Shop. A fun filled weekend is Logger Days. It is held the third weekend in July and allows live viewing of chainsaw competitions. Oh what beauty there is to see during the fall as the leaves turn varying shades of yellow, read, and orange!! 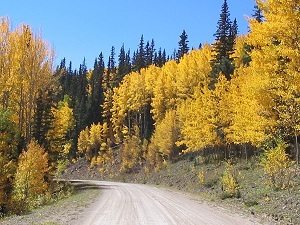 Any forest service road you drive down becomes splashed with vibrant colors. There are three hunting units that offer trophy deer and elk but these are draw only limited license units. There are counter tags available as well as licenses for other animals such as moose, mountain lion, bighorn sheep, and waterfowl. Farm tours are also available at some local farms where you can watch the harvest of potatoes, grain, and carrots. With the ski area that receives the most snow in Colorado only 18 miles away, it is a great winter destination. Wolf Creek Ski Area has over 1,600 acres of skiable terrain. Snowmobliers, snowshoers, and cross-country skiers also enjoy over 255 miles of groomed trails. Ice skating, sledding, and ice fishing are also just a short drive. Don’t worry if you don’t own your own equipment as you can rent sleds, tubes, ice skates, snowmobiles, and much more to make your vacation fun. 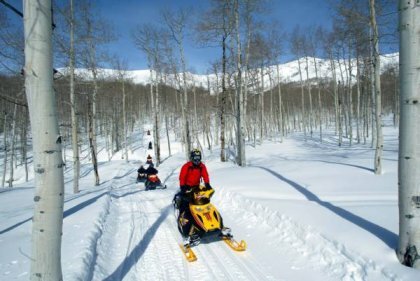 There are also guided snowmobiling tours. For a different get away vacation try staying at one of the many cabins instead of in a hotel. Cabins are a great way to feel closer to the outdoors. Most cabins have a kitchen and laundry room to make you feel at home. There are also many RV/tent sites available. There are several Bed and Breakfasts that offer full breakfasts each day or the traditional hotels with continental breakfast provided. Whatever your housing needs may be, you can find it here. Have only a few days to see South Fork and the surrounding areas? Pick up a South Fork booklet at any of the visitors centers and it will give you the best things to see and do in 3 days. It caters to different interests with 3 days of wildlife viewing, fall colors, history, or winter fun. Want to do a little of each? Combine several of the suggested days to customize your trip to your own needs. The visitor’s center also has maps, brochures, and can answer any questions you may have about the area. It’s a great way to find out the best places to explore. As you explore the South Fork area take the time to watch for wildlife, birds, and wildflowers. The area is full of wildlife, from the commonly seen squirrels, rabbits, and deer to the more elusive elk, black bear, and mountain lions. You might even be lucky enough to catch a glimpse of a lynx. Keep your eyes peeled and your binoculars and camera ready as you never know what might be around the next bend. There are also over 260 species of birds. You can expect to see bluebirds, humming birds, wild turkeys, eagles, hawks, owls, and many more. Stop by the visitor’s center or the Alamosa Wildlife Refuge to get more information about the local birds and where to see them. As you drive around the roads don’t forget to look for the wildflowers that are in bloom. There are many different colors and shapes. 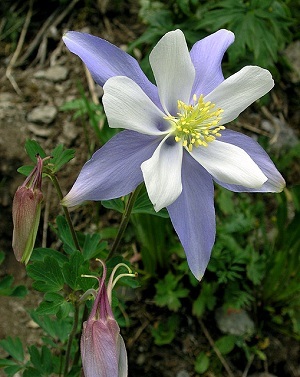 The columbine, Colorado’s state flower, is also dominant in this area. Look for bluebell, lupine, wild iris, sunflower and black-eyed Susan to name a few. 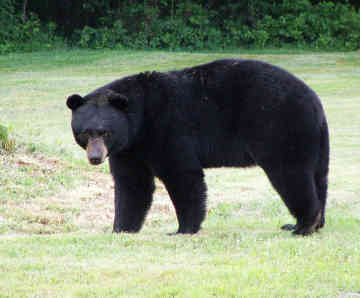 I hope you look forward to visiting South Fork. If you love the outdoors this is definitely the place for you. With acres of National Forests to explore during any season I hope you can find something to please the whole family.